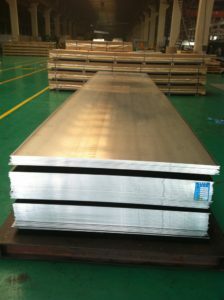 The main alloying elements of 6061 aluminum sheet are magnesium and silicon, mainly in the shape of aluminum sheet, the tempers generally are T6, T4 and T651. The hardness of 6061 aluminum sheet is more than 95, which is widely used in mechanical processing industry. A small amount of copper or zinc can be added in the production to improve the strength of the alloy without significantly reducing its corrosion resistance. There is also a small amount of copper to offset the negative effect of titanium and iron on conductivity. To improve the machinability of aluminum sheet 6061, lead and bismuth can be added. 6061 aluminum platecan be sued for process industrial structure with high strength, weldability and corrosion resistance requirements, such as manufacturing trucks, towers, ships, trams, furniture, mechanical parts, precision processing and other pipe, rods, profiles, sheets.